An impressive aerial view of Comikaze 2015. As you probably know by now, we hit up LA’s Comikaze Expo again this year – this time only bigger and better than the last. The Comikaze welcome-speech by Stan Lee. What. A. Legend. - We stumbled into the Visionbooks booth, showing off their newly-innovated 3D animated comics. That’s right, folks, comics nowadays are no longer just ink and paper – they’re 3D images with action and dimensional visual effects, downloadable at the click of a button. I’m sure this idea will divide a lot of comic fans, but it’s undeniably an exciting concept. They’re not fully animated movie slides, of course, because that would be pointless (you may as well just watch a film then); instead, they feature just enough basic effects and animation to make the comics pop out and that little bit more fun to read. Check out their website and app for a great selection of free animated comic books! Genevieve trying not to knock over Slenderman. R.S. "Corpsy" Rhine and model Sara Hedgren at the Girls and Corpses booth. - Girls and Corpses Magazine was there again this year, along with an impressive line-up of models (Tera Patrick, Samantha Fairley, Jillian Janson, Sara Hedgren…) to lure in the unsuspecting bypasser…not that a bunch of magazine covers with hot girls and eerie corpses wouldn’t be enough! Check out our full interview with creator and editor, "Corpsy," right here. - There appears to be a new geek dating-site on the market, namely Cuddli. For anyone seeking a potential partner or friend, check out this brand new social site – forget OK Cupid! and Match, get on this one, y’all! Oh, and it’s fully LGBTQ-friendly! - The Time Warp Creations booth was exciting, with an amazing array of hand-crafted watches and other accessories. You wouldn’t think it, but these watches really blow our minds. They’re all zombie and sci-fi themed, as well as super hi-tech…definitely something for our wish-list! Their website is definitely worth checking out, even if only to admire the craftsmanship. - We also discovered the Vestigia booth this year, which we were thoroughly impressed by - aliens, treasure hunts, and monsters, what could we not like? Created by Scott Johnson of Haunted Sketches, the comic book project saw great success via its crowdfunding campaign, and is luckily still available via the Indiegogo page for now. Inspired by Tim Burton, The Goonies, and Adventure Time, this guy certainly has it all covered. Check out his intro video right here. Lost and in need of some directions? Fret not, its omikaze to the rescue! - Want some awesomely cute jewellery, whilst supporting local artists and craftsmanship? Check out the brandsboutique.com, which holds regular events and pop-up shops around L.A, featuring hand-made accessories from around the area. Get your kawaii on! Head over to thebrandsboutique.com for more info, or check out their facebook page here. - DefectiveGeeks.com. Now this was definitely something new and interesting. “A blog by lady geeks!” you say? I’m in! (That’s what he said…) I absolutely adore what they’re doing and the drive behind their content – a bunch of super-cute girls writing about super-cool stuff? #amazing Be sure to keep up-to-date via their Twitter. The awesome little display at the booth of The Flux Capacitors - be sure to check them out live when they're in your area! 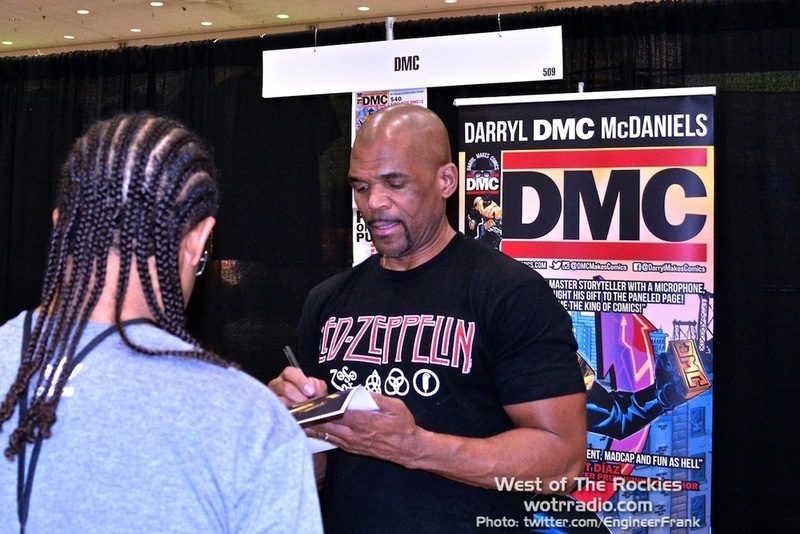 - Good ol’ DMC was there again this year, once again promoting his DMC Comic. However, just like last year, I was absolutely not impressed by the fact he was charging for everything. Photos, posters, breathing within a 10-foot radius…. Any of that would cost you at least $10 or $20… Seriously, DMC, you can do better than that….this is not the way to do business and gain followers…hashtag disappointed. - The Eddi App booth was proof that good marketing really does work. They drew in some serious crowds with their Trooper costumes and dance displays. The highlight of the show was obviously the official Hip Hop Trooper though. To see some of his work, check out the Hip Hop Trooper video page - you won't be disappointed (I mean, it's a dancing storm trooper, how could you be?). - More proof that inventive advertising truly works: the Downward Viral’s booth (an exciting new “zombie card game”) offered by-passers a free little photo session, with a tableful of geek props and gaming weaponry to select from for extra posing fun. Their kickstarter campaign has been hugely successful so far, and it’s easy to see why – check out their campaign right here. The #amazing display put on by the Hip Hop Trooper dance crew at the Eddi App booth. The famed De Lorean, fully equipped BTTF-style. A scarily realistic Borg, at the Hollywood Sci-Fi/Horror Museum booth. A Halloween costume like that, now that would be cool. 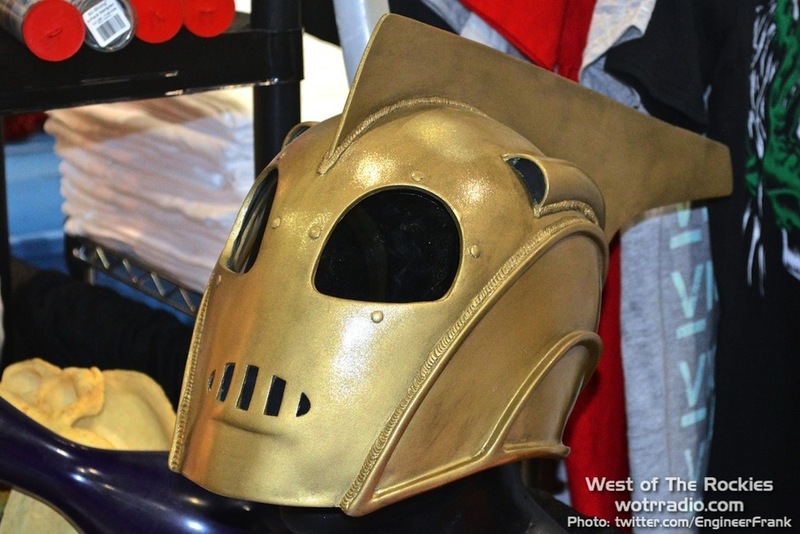 - One of our personal favourites was The Hollywood Sci-Fi and The Hollywood Horror Museum booth. 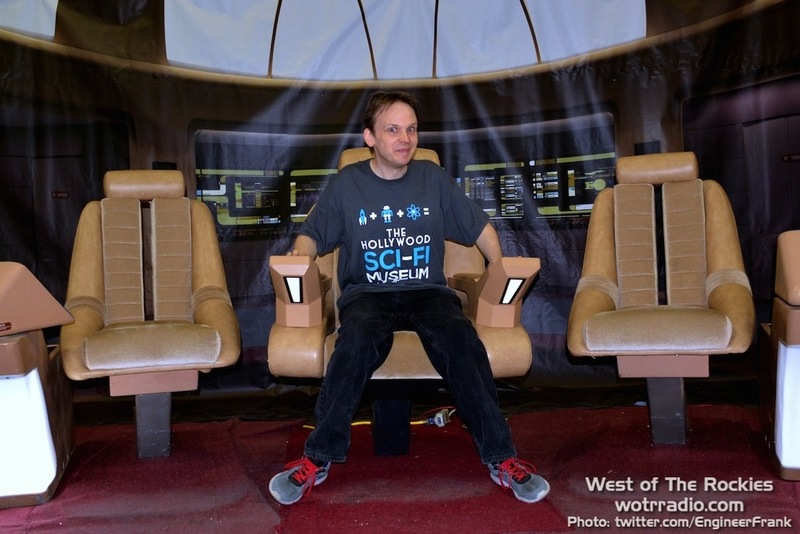 We interviewed Huston Huddleston, founder of both said museums, a few weeks back – having never have met him IRL, we were of course excited to meet him for the first time, as well as see the Star Trek Bridge set for the first time. (50 selfies later, my phone storage ran out at this point…) Once again, the display was rather impressive, including not just the Star Trek bridge set, but also the DRAG-U-LA car from The Munsters, the Flintstones car, a freakily realistic Borg figure with full outfit, alongside a bunch of other super-cool outfits and props. One thing’s for certain – those two museums are going to be ridiculously amazing. The "I Ain't Afraid Of No Ghost!" panel. From left: Christiane Elin, Susan Slaughter, Ben Hanson, and Kristen Luman. Apart from all that, we also attended a few panels again, though they seemed to be lacking somewhat in the variety and interest department this year. There appeared to be a heavy focus “How To” and advice panels, providing guidance on how to make it in the various aspects of the comic and geek world – writing, drawing, producing, cosplaying etc. That’s great, of course, especially if you’re hoping to start up a business in that scene. A little more comedy and horror thrown in might have been nice though, perhaps a couple more movie screenings. Alas, next year, hopefully! In any case, the horror panels were thoroughly entertaining, with our good friend Christian Elin of Haunted OC and Red Glean leading the, “I Ain’t Afraid Of No Ghost!” panel, and the awesome APRA with their, “Haunted L.A.” panel. 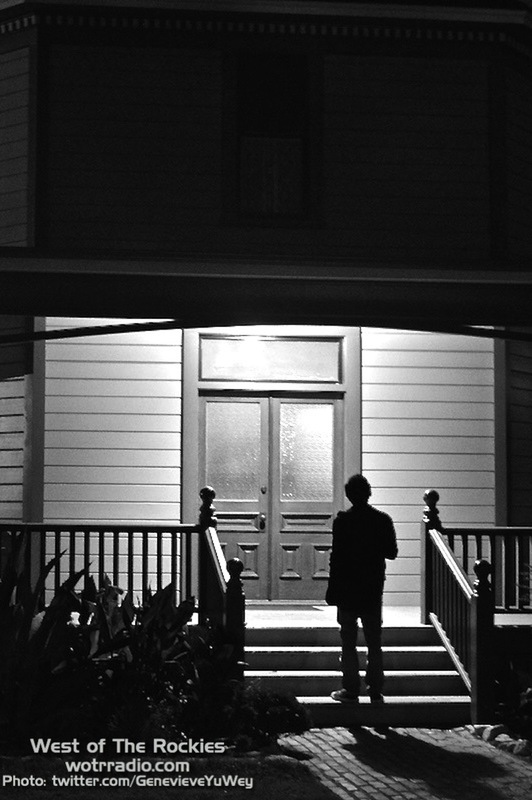 APRA previewed their upcoming feature-length documentary, Into the Dark, which honestly looks fascinating, taking an explorative yet rational approach, the likes of which is not often seen in the paranormal field. Check it out here (right). Stan Lee at the SLKU press conference, animatedly describing their upcoming children's publications. We had the privilege of attending a Stan Lee press conference, unveiling a brand-new children’s book by SLKU (Stan Lee’s Kids Universe). Sure, we explore plenty of weird, alternative, and sometimes adult-themed topics, but let’s not forget about the kids! SLKU will soon be releasing its Dragons vs. Pandas book, it’s very first publication ever to venture into international content – it’ll debut in the US and in China, and shall be published in both English as well as Mandarin. They also announced the upcoming, B is for Blobfish, a super-cute picture book highlighting the oft-unloved creatures of the animal kingdom. So if you’ve got kiddies, or are perhaps looking for nice gift for a friend’s son or daughter, have a look at stanleeskidsuniverse.com for fun yet education-driven ideas (no, we’re not getting paid for this!). The investigation team-leaders of the Haunted OC Ghost Hunt, held at the Heritage Square Museum. Clockwise, from top left: Christine Larson, Ben Hanson, Chad Lindberg, Susan Slaughter, Kristen Luman, Mario Bernal, and Don Staggs. Comikaze also had an official “Ghost Hunt” this year, led by Haunted OC. The event was held at Heritage Square Museum in Montecito Heights, where investigators had the opportunity to explore four Victorian mansions, built around the 1870s onwards. Guests were divided into four groups, whilst the lead investigators were divided amongst the four mansions – each group would spend an investigation session in a pre-assigned house, before moving on to the next one, in this way allowing everyone to investigate each building once, as well as experience the different investigation styles with the various leaders. The ghost hunt groups were lead by Ben Hansen (Fact or Faked, UFOs Declassified) and Christine Larson; Susan Slaughter (Ghost Hunters Academy, Ghost Hunters International) and Chad Lindberg (Ghost Stalkers, The Fast and The Furious); Kristen Luman (Ghost Mine) and Mario Bernal; and long-time paranormal investigator and psychic, Don Staggs. Famed comic-artist and writer, Jim Lee. If you’d like a full review of the night’s evidence, be sure to keep an eye on Mario's website as it gets uploaded! Alas, we hope you had as much fun reading this as we had going to Comikaze (alright, maybe not quite). It was a tiring three days, but certainly nothing that wasn’t worth it! Hopefully we’ll see more of you there next year – for now, it’s over-and-out. A DeLorean, fully-equipped BTTF style, at the www.teamtimecar.com booth. 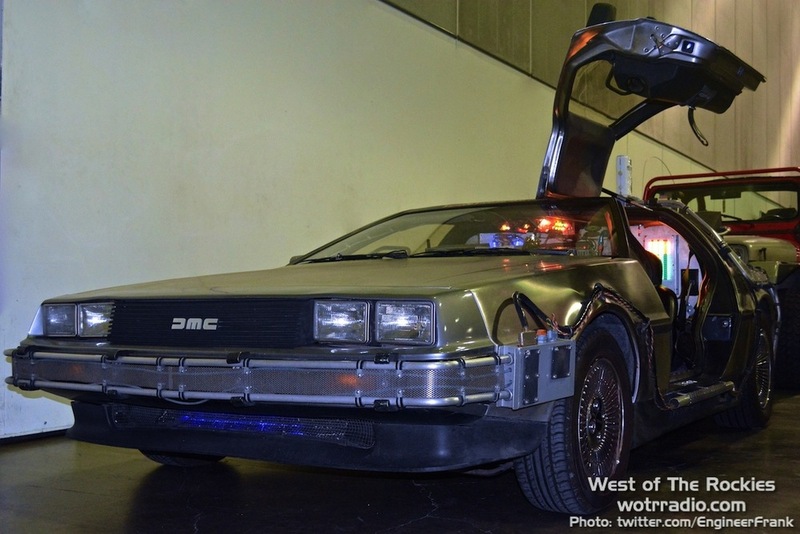 A great view of the DeLorean, fully-equipped BTTF style, at the www.teamtimecar.com booth. Front view of the DeLorean, fully-equipped BTTF style, at the www.teamtimecar.com booth. Two of the "eddi troopers" at the eddi app booth. Proof that great costumes and advertising really do work. The Flintstones car at the Hollywood Sci-Fi/Horror Museum booth. 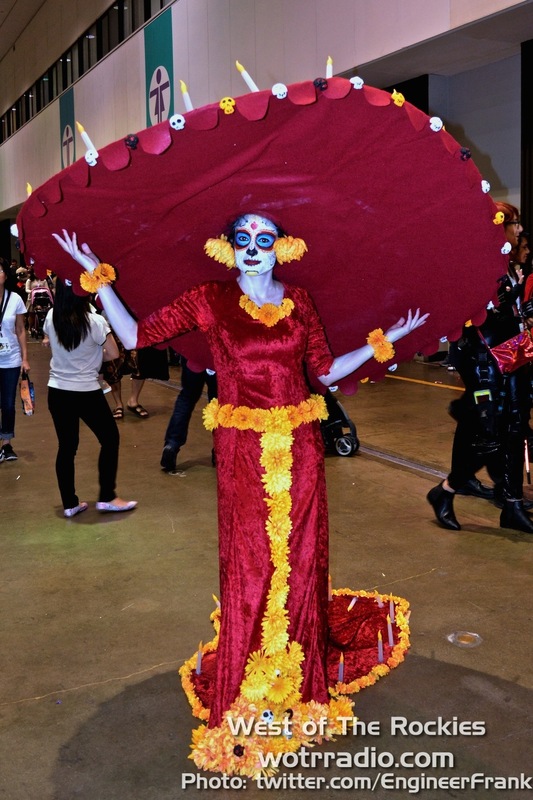 Going all out with this halloween costume, à la Book of Life's La Muerte. Huston Huddleston of the Hollywood Sci-Fi Museum and Hollywood Horror Museum. Costumes at the Hollywood Sci-Fi Museum. Awesomely nerdy merchandise at the Hollywood Sci-Fi/Horror Museum booth. Sara Hedgren and R.S. "Corpsy" Rhine at the Girls and Corpses booth. More from the Girls and Corpses booth. Frank in front of one of the Victorian Longfellow-Hastings Octagon House, Heritage Square Museum. The DRAG-U-LA car from The Munsters, at the Hollywood Horror Museum booth. More from the Hollywood Sci-Fi/Horror Museum. Genevieve hangin' out at the Tardis, chillin' Dr. Who style at the Hollywood Sci-Fi Museum booth. 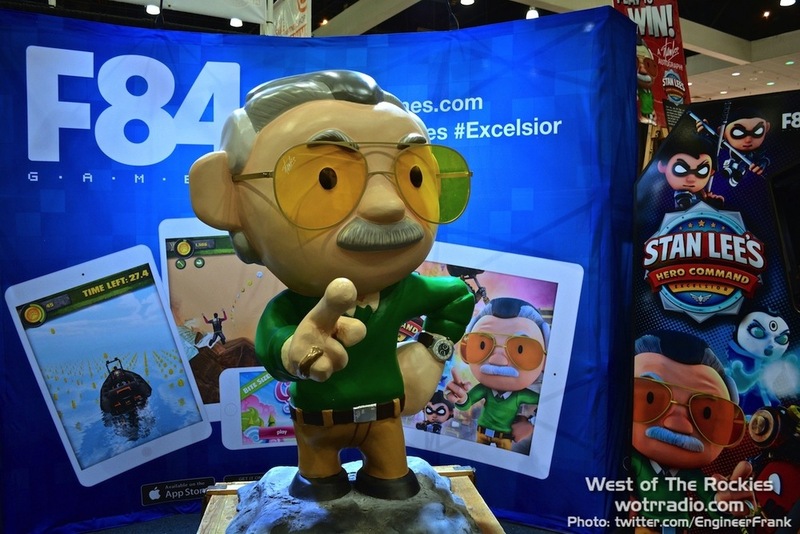 Stan Lee, all cute and cartooned-up! Stan Lee et al. at the welcome speech, shortly before unveiling POW! 's and Studio Dean's brand-new series, "The Reflection." The "eddi troopers" at the eddi app booth. Stay classy, folks - See y'all next year!